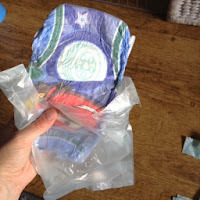 Ok, so I'm at risk of stating the bleeding obvious here, but it took me quite literally over a year to work out how to store my nappies (well pull up pants now!) 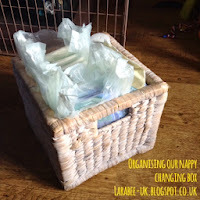 way after I'd gone back to work and had was no longer changing 8-9 nappies a day! 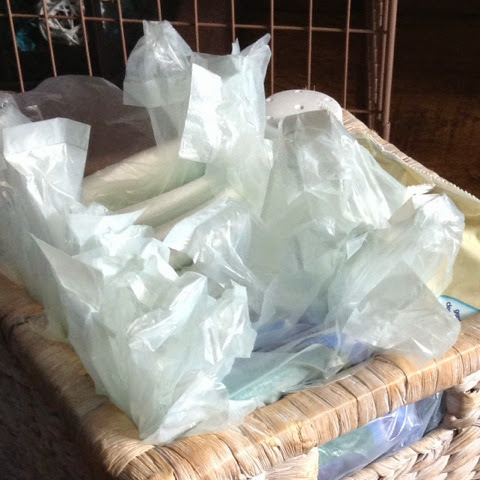 I'm afraid we use disposable pull ups and nappies before that, although I do make sure we use biodegradable nappy sacks, I tried using washable but found them a nightmare as T had a lot of tummy and digestive issues and 3-4 dirty washable nappies were so difficult to manage. I also looked into the people who come and dispose of your 'regular' nappies but the cost was astronomical so I'm afraid it had to be regular disposables. I'm not sure why I felt I had to justify that but there you go! We use both day time and night time pull up pants. 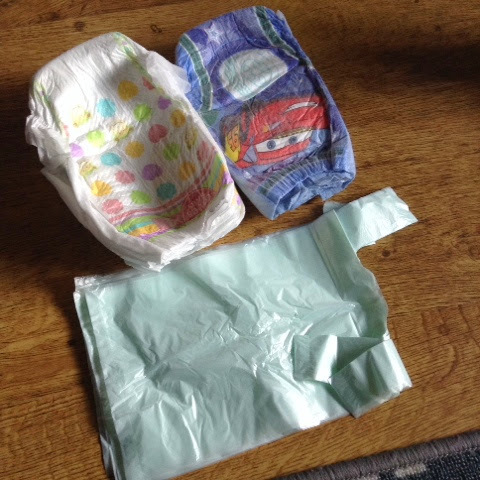 On a Sunday and Wednesday I get about 13 day pull ups and 7 night pull ups, I take about 5 mins to put each pair of pull ups into a nappy sack, these then get stored in a small basket along with wipes, powder and nappy cream. This means that during a nappy change there's no fiddling with opening the nappy sack or struggling to get a pair of pull ups out of a pack. This also keeps the hubs very happy as he can never open the nappy sacks so he is much more likely to do the change since I started organising our changing box this way! I also use the same method for my changing bag keeping supplies for 5 changes in a clear bag. I also keep, nappy cream, hand sanitiser and teething gel in there. 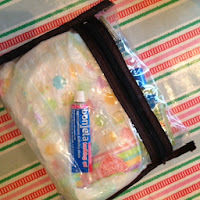 Unfortunately, wipes don't gut but I keep them in my changing bag too. As soon as I've been out and a change has been used, I go to my changing box and refill the changing bag, that way I'm always ready to shoot out! I hope that this hasn't been a bit of a no brainer and does help someone out there, although some organising ideas are obvious, they are not always obvious when we first need them are they? Hope you are having a great week, I'm a golfing widow this week so lots of time to sit, play, cuddle and read with my little man, Lx.